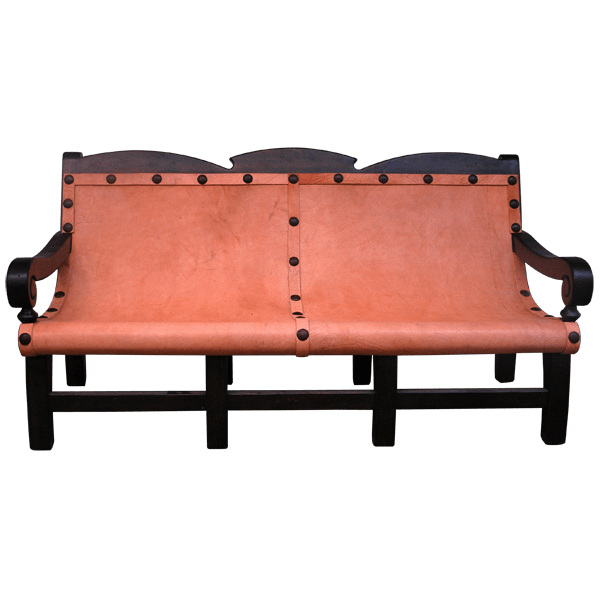 With its lovely, curved, reclined body, this handcrafted, Spanish colonial style bench is as comfortable as it is beautiful. The seatback and the seat are upholstered in one continuous piece of natural rawhide. The rawhide on the top, the center, and the sides of the bench are secured by large, black, hand forged, iron nail heads intermittently hand tacked to the frame. The bench is full of details, from its Western cut top crest, lower scrolled lip, to its curved armrest. The armrest end in a hand carved, scrolled design. The bench rest on eight, straight square cut legs, with front and back square cut crossbars. Both beautiful and durable, it is made with the best, sustainable, solid wood available. It is 100% customizable.